Everything we do generates power  about 1 watt per breath, 70 watts per step. This year, Michael McAlpine of Princeton University and colleagues figured out how to turn locomotion into power by embedding piezoelectric crystals into a flexible, biocompatible rubberlike material that, when bent, allows the crystals to produce energy. Put the crystals in shoes, say, or implant them directly into the body and they could produce enough power to charge personal electronics or internal medical devices. 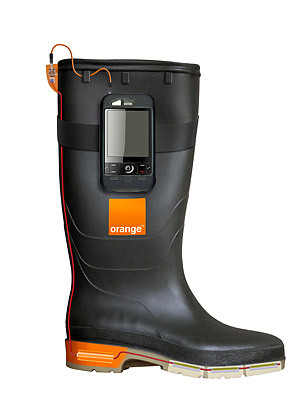 Elsewhere, telecommunications provider Orange introduced a prototype of Orange Power Wellies  rubber boots that convert heat into current. Campers at Britain's Glastonbury Festival were the first to demo the footwear. (With the current model, it takes 12 hours of walking to charge a cell phone for an hour.) Of course, if you assemble enough people in a tight space, they don't even need to move to generate energy: in Paris, engineers have captured the warmth generated by bodies on the Métro subway to heat a public-housing project on Rue Beaubourg. By 2011, the Métro heating system will cut carbon dioxide emissions from the housing project's heating system by a third.